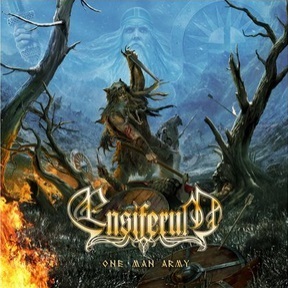 Ensiferum revolutionized the “folk” melodic death metal scene with its first two groundbreaking releases Ensiferum and Iron, but many line-up changes let the band down in following years. The band’s other records have some great tunes but also an elevated amount of filler material consisting of aggressive, dull, and fast melodic death metal tracks, exchangeable slow-paced folk ballads, and overambitious epics with unnecessary lengths. The new record, One Man Army follows this inconsistent mixture. The epic instrumental opener “March Of War” starts the record in a cinematic way and builds up expectations which are immediately crushed with the bland melodic death metal track “Axe Of Judgement”. What then follows is the atmospheric, catchy, and epic “Heathen Horde”, which is probably the greatest hit on this mixed bag of an album. The decent title track “One Man Army” is one of the rare exceptions where the band successfully manages to mix melodic death metal passages and folk melodies in a balanced way similar to what it accomplished on its first two records. The album goes on with many ups and down. “Burden Of The Fallen”, “Warrior Without A War”, and “Cry For The Earth Bounds” are three great tracks in a row – which is a real exploit for such an unstable band. These songs are all mid-paced, convince with enchanting folk melodies, diversified female and male vocals, powerful choirs, and an overall epic atmosphere. What then follows is the weird “Two Of Spades”, that tries to sound new and original, but ends up sounding like a stereotypical and mildly amusing pop song by Dschinghis Khan rehashed by contemporary Turisas. “Heathen Throne Part III” follows the first two parts on From Afar and has been divided into two songs with a total running time of almost sixteen minutes. Both tracks have noticeable lengths and fail to develop a gripping atmosphere, memorable or catchy moments, or at least some smart progressive song writing that would be desperately needed for such a long tune. The confusing album closer “Neito Pohjolan” is a mid-paced and rather melancholic folk song without any metal elements and features only female vocals. The track doesn’t sound like Ensiferum and only adds to the weird potpourri of an album. This record is a perfect example of a complete hit and miss release. The four bonus tracks underline the band’s inability to write with coherent record. Each of the four tracks sounds completely different. “Rawhide” is a decent cover of an epic song taken from an old movie soundtrack; “Warmetal” is a solid cover of an obscure Finnish black metal band; the toothless “Candour And Lies” sounds like a smooth vintage country song that might impress pensioners from Texas or maybe Clint Eastwood himself; and the shameful “Bonus Track” seems to be an unstructured and failed attempt at some sort of self-parody in the key of Edguy. This little bonus disc unfortunately resumes everything that is wrong with Ensiferum. This band should immediately rethink its song writing or get some external support, because almost all of its tracks go everywhere and nowhere at the same time, and waste a lot of great potential. This band is a really desperate case. The quintet still has a lot of creativity and energy but the musicians are completely unable to catalyze these promising elements. Even though this album has a lot of ups and downs, it’s filled with passionate energy and has several moments of stunning creativity. Therefore, I think it still deserves a decent rating. However, I really can’t recommend this release because of its bad song writing, which induces some serious headaches.